A Democrat congresswoman asked James Comey to explain the process of an ongoing investigation. Well, they’re following a lot of nothing right now. Because there isn’t any evidence. None whatsoever. And were you as impressed as I was about how serious James Comey was about how serious a crime it is to release classified information? Trey Gowdy really pumped him on this today. And these guys don’t seem interested in finding who leaks this stuff. They’re not interested. They don’t want to discuss it. They don’t want to go there. They’re not interested in who unmasked, for example, Mike Flynn. Now, the way Flynn was caught, Flynn was not being surveilled. I knew this was the case. The Russian ambassador is being surveilled and so what happens, the NSA is monitoring whatever the Russian ambassador does, and there’s a phone call with Flynn, Mike Flynn, and they hear it. Now, when something like that happens, and Flynn’s not the target, they’re supposed to ignore it unless what they hear constitutes without question serious criminal offense. It’s part of the protection built in. If you’re gonna be monitoring foreign actors and they have dealings with Americans who are not targets, not persons of interest, when you hear them, you’re supposed to ignore ’em and nobody’s supposed to tell anybody what was said. Well, we know everything Flynn — well, we don’t know. That’s the point. You have to unmask that person if doing so is warranted by evidence and circumstance. And so Trey Gowdy was asking of the unmasking of Flynn, but Comey said, “I can’t comment on individuals. I can’t comment on what’s in the news. I can’t comment on the media reports, I can’t comment.” So Gowdy had to ask generic questions about theoretical circumstances to get Comey to even play ball. It was clear that Comey didn’t want to say anything about that, except how serious a crime it is to release classified information. He said it over and over again. He stressed it so much that I couldn’t help but think this is a different James Comey from the FBI director who said that no prosecutor would prosecute Hillary Clinton for releasing classified information in her email. That’s what she did, and Comey’s the guy who said (paraphrasing), “I couldn’t find an illicit motive, an absolute illicit motive, there’s no reason to prosecute her.” And yet look what we’re doing here. It’s the exact opposite of the way Comey said he had to deal with Hillary. James Comey said that he couldn’t confirm that there would ever be an investigation of the leakers, while admitting it’s a felony. He didn’t act interested in pursuing that investigation whatsoever. Comey has 5 children, but I understand that controversy surrounds the process/paperwork for those who were adopted. Why has this not been investigated? 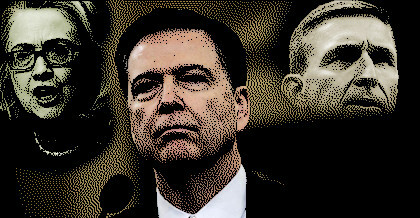 Has Comey drained his own swamp?